Regardless of the fact that Thierry Guetta's country of residence officially changed from France to the United States in the early '80s, it's safe to say that continuing to possess a very thick accent decades after settling into life as a shopkeeper in Los Angeles worked to Guetta's advantage given his addiction to constantly videotaping everything in sight. For although Guetta's incessant need to capture every aspect of his daily life was as natural as his accent as far as his friends and family were concerned, to random passersby who were none the wiser, Guetta simply got away with the rolling camera because they could easily mistake him for a foreign tourist. Yet when graffiti art became Guetta's latest obsession as he turned his lens outward to film the creatively daring pranksters and spray paint or stencil wielding vandals that treated the streets like it was an open gallery, his penchant for video voyeurism couldn't simply be mistaken for touristic culture clash anymore. So even though Guetta knew that every tape he filled would be meticulously filed in plastic boxes stored in his home– some without even a descriptive label – which he never planned to view again, Guetta realized he'd gain greater access and experience superior vicarious thrills by telling the objects of his fascination that he was a documentary filmmaker. In doing so, he steadily built a solid word-of-mouth reference-based reputation that hooked Guetta up with more vandals around the globe. And after working his way up the street artist food chain to finally form an alliance with the world famous illusive “art provocateur” prankster Banksy, events take a decidedly unexpected turn in the second half of this acclaimed Sundance favorite . For although Banksy informs us early on that the work will eventually do a 360˚ turn and focus on the man behind the camera since Banksy found the prospect of filming Guetta far more thrilling than taking part in Guetta's never-ending odyssey of largely unusuable video footage, we're still unprepared for the way this ultimately plays out. Endlessly surprising, Exit is destined to inspire passionate discussions and even arguments regarding not only the criteria, value and overall validity of art in general but similar debates and inquiry when it comes to analyzing the film itself as a work of truth, fiction, performance art, or something in between. A groundbreaking send-up on the medium of documentary filmmaking -- we're torn between the adages that truth is stranger than fiction and the thought that if something sounds too good to be true it probably is. 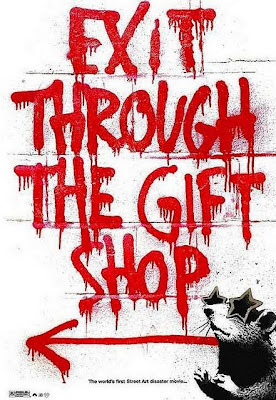 And sure enough, Exit Through the Gift Shop grows incredibly provocative as the subject and the videographer switch roles and we take in the various thematic, structural and unpredictable incarnations on display. However, even if we did learn the truth – which I hope we don't – the major questions the film raises about art, creativity, hypocrisy, authorship, elitism, and group think still remain. Likewise, because of the amount of mystery that surrounds the subjects given their very nature as artists working outside the boundaries of the law, Exit succeeds where the poorly devised and executed Casey Affleck performance piece I'm Still Here starring Joaquin Phoenix failed. Essentially Here called its own bluff by showing us its cards way too early, thereby making one think their talents would've been better suited to creating a whole new Sacha Baron Cohen inspired mockumentary character for Phoenix to play that wasn't purportedly based on himself. So while Here will be short-lived, by contrast, Exit will continue to resonate for years because it generates the same thought-provoking response that a piece of street art does. 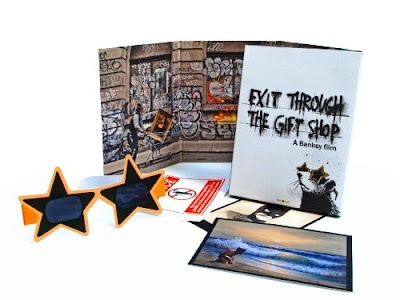 However, instead of one of Guetta's tapes that can be erased or graffiti that can be repainted (or like in Here an acting career that Phoenix can simply continue), because it's a film, Exit achieves the same type of consideration given to picture hung on a wall inside a museum as opposed to a fleeting existence plastered on a wall in the gallery of the street.